You guys, I’m so excited. The eternal winter has finally ended and the warm weather is, officially, here to stay! I’m so ready for these warm days because it means soaking in that precious Vitamin D and spending my days by the pool. This year is particularly special, though. This summer, I’ll have a newborn. While I could freak out about the fact that I’ll now have two kids under 2.5, I’m deciding to be so excited about the fact that now I get to make summers special for my own kids! Newborns are extra, extra, extra vulnerable, though, so I went on a search for the best baby tents to keep my little one protected for the long days we’ll inevitably spend outside this year. It goes without saying that sun protection is, easily, one of the most important things to keep in mind while spending any time outside. This is true for every single person, no matter what age or skin tone. No matter who you are, what you do, who you know, where you live, how you spend your time, or why you do what you do, your skin needs to be protected from that sly Mr. Sun. Skin Cancer is the most common type of cancer in the US of A right now, which means that we need to be more vigilant than ever. It must be the mom in me, but I just want to go over a few things everyone can do to protect themselves before we get to the really fun part (shopping!!) of this article. Of course, there’s the obvious: cover your body. But when it’s closing in on 100 degrees Fahrenheit and the humidity level is up to 85%, there is nothing less I want to do than wear a whole bunch of clothes. Now, there are breathable clothing options that will keep you from feeling like you’re going to drop down from a heat stroke. Two of the most common fabrics that will keep you covered, and as cool as you could possibly be while wearing clothes in the blistering sun, are cotton and linen. Linen is often used in beach attire. You can find clothing made of either material in really any clothing store. So, go crazy!! Another obvious form of sun protection is sunscreen. There are, literally, hundreds of brands of sunscreen out there. It really just comes down to preference. Personally, I like more natural options, especially since my two year old has an allergy to the interaction that happens between the sun and popular sunscreen brands (this is called a photoallergy which I had no idea even existed until my kid started breaking out in rashes every time I put sunscreen on her and had her out in the sun). If you’re interested in a more natural approach to the sunscreen dilemma, I really love a vegan, 100% organic, sunscreen called ‘Fun in the Sun’, sold by Mother Green’s Boutique. Sunscreens lose their effectiveness after a year or two. So, you should really toss those bad boys if they have been sitting in your cabinet for awhile. The effectiveness of sunscreen is determined (and altered) by the wind, humidity levels, and sweat. Sunscreens could also lose their potency when combined with bug spray, so definitely keep that in mind. If you want to know more, you can head over to the CDC website and study up before your romp in the sunshine. Here’s something else you should keep in mind about popular sunscreen brands: they’re generally not safe for babies under six months. This is SUPER inconvenient for me because, like I said, I’ll have a newborn this summer. My pediatrician told me that the benefits outweigh the risk, but I’m not super keen on putting harsh chemicals on my brand new baby’s skin, anyway. So, how am I supposed to protect my baby if I can’t even put regular sunscreen on her? I don’t want her little body to be overheated, so I really want to limit the amount of clothes that I put on her. So, what do I do?? Well, for starters: Fun in the Sun to the rescue! Next? This is where the fun stuff comes in! Buckle up, we’re about to get down to business!! BABY TENTS! Yay!!!!! Shopping! YAY!! I’m excited to dive into this because I went on a super long search and I came up with some really good options for you guys. I covered all of the bases from style, protection, and affordability. The good news is that baby tents are not that expensive, can be found (literally) anywhere, and come in some really cute styles!!! I mean, who doesn’t love something that does the job while still being cute and cheap? The first baby tent I came up with comes from Amazon. It’s made by Schylling and comes in a nice blue color. The great thing about this tent is that it has a 50+ SPF (‘Sun Protection Factor’), which will keep your baby super protected. Schylling markets this as ‘ultra portable’, which is a lifesaver when you already have to lug around kids and all of their gear. In fact, it comes inside of its own little pouch that you can sling across your shoulder when you head down to the beach, the pool, or just your backyard! This tent is made of waterproof material so you don’t have to worry about it getting ruined. As far as baby tents go, this seems like a really good option! A bag that everything fits into when it’s all folded up. This Kilofly tent has a UPF (‘Ultraviolet Protection Factor’) of 35, so there is still great protection for your little one’s skin! Honestly, so far, this one seems like the best bet. 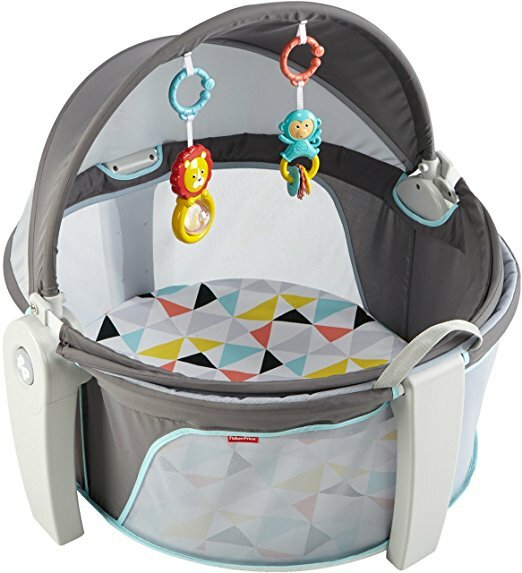 The next baby tent that I picked out to choose from is one that combines a couple of nice factors of the previous two options. Made by LOCHAS and sold by Amazon, this baby tent has the SPF of the Schylling and the protection from critters of the Kilofly. 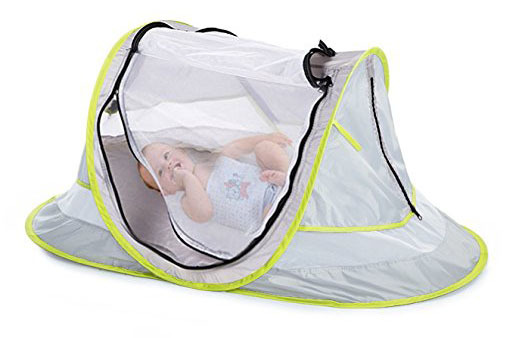 This LOCHAS tent is made completely of breathable fabric, including some serious mosquito netting to protect baby from those pesky, flying, jerks. LOCHAS boasts that this is a seriously lightweight contraption that weighs only 3.6 pounds when it’s fully assembled! Assembly seems easy enough, which it generally is for these kinds of tents, because the tent just pops up and it’s done! The only downfall that I can tell is that the reviews are nonexistent. Does that mean it just hasn’t gotten recognition? Probably! So, I would discount it based on that alone. Surprisingly enough, Fisher Price also sells its own version of a baby sun tent. However, I think it’s more of a pack n play than anything because it doesn’t just pop up like the others. 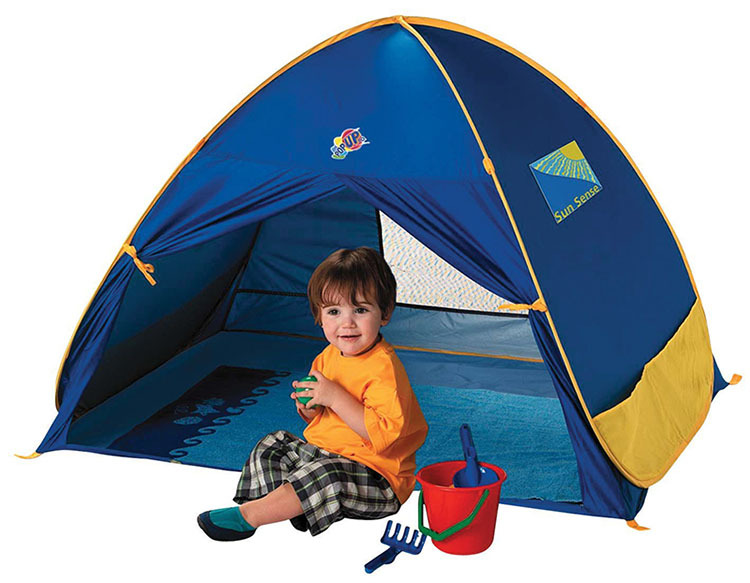 In fact, Fisher Price brags that it has a 2-in-1 dynamic that means it doubles as play space and a tent. While it might not be as portable and lightweight as the other three options I picked from, this one definitely has some redeeming qualities. To start, it does fold up to form a flat shape that can be packed anywhere. The handles that are attached make carrying it around easy enough. Like the Kilofly, it comes with a toy bar but, unlike the Kilofly, toys are actually included! While this tent is double the price of the others, it’s not really in the same lane. When choosing the one that I wanted from the list of four that I previously listed, there was only one that seemed the most appealing to me. Believe me, I went through a whole bunch of baby tents and it really was a hard decision. Especially since they’re pretty much standard across the board. However, in the end, the Kilofly won by a landslide because I just can’t get over how versatile, convenient, and affordable it is. I mean, it’s the perfect choice for my newborn. Whatever you choose, though, it’s going to be a good choice. Simply because none of the options that I came across were inherently bad. Cool! Usually, this is the part of the article where I’d wrap it up and send you on your way, but I really wanted to take the time to reiterate how important sun protection is for every single person who may be reading this. Like I said before, skin cancer is the most common type of cancer that’s prevalent in America, today. That means that about 4.3 million cases of it pop up in a given year. Luckily, even just taking basic precautions reduces your chance of developing any type of skin cancer by a great deal. And, while it may be late in the game for you (though, it really is never too late), the best thing we can do is to set our kids up for a future of healthy skin despite the dangers of too much sun exposure. For example, keeping communication open with your kids from a young age about what can happen and what they can do to protect themselves from the consequences of just a little too much fun in the sun is a good start. Try incorporating a little lesson into your preparation by letting them know that the sun is a great source of energy and vitamins for our bodies, but that too much can hurt us. So, to make sure we don’t get hurt by being in the sun for too long, we have to use sunscreen (and other protective measures) to protect our skin! If you didn’t know, the AAD (American Academy of Dermatology) recommends that all kids wear a sunscreen with a minimum of SPF (‘Sun Protection Factor’) of 30. Also, according to kidshealth.org, there are a couple of other safety precautions you can take so that your babies are nice and protected. Double checking your kid’s medicine (surprisingly, some medicines make your skin more susceptible to sun damage). Look, guys, I really am just like any mama out here nowadays; I want what’s best for my kids. I mean, what good mom doesn’t? One of the most important things I’ve learned since having my own kids is that babies start learning from, literally, day one. Maybe even before day one, though there’s not much you can teach them while they’re still in your uterus. Keeping that very important piece of information in mind, starting the conversation early in their life about what they can do to protect themselves from the dangers of the sun can really only do you (and them) good. “But, wait, Desiree! My kid is 2 months old! How can I teach her about the sun right now?”, you may ask. Well, mama, that’s why I went on the best baby tent search! Just for that! Have fun this summer and don’t forget to wear your sunscreen! !